As long as Knowledge Management involves face-to-face interaction between teams and individuals, Facilitation has a key role to play. This requires balanced input from many people; not a few people talking, and the others listening. It requires process to be followed, within a given time frame. Without a facilitator, none of these are easy to achieve, particularly when you want to achieve the high-quality dialogue that is the basis of knowledge sharing! Facilitation is the process of making it easier for a group to effectively deliver the objectives of a meeting such as a Lesson Capture meeting, a Peer Assist, or a Knowledge Café. By providing non-directive leadership, the facilitator helps the group negotiate the meeting processes, so that the group arrives at the required objectives. Their role is one of assistance and guidance, not control. The facilitator looks after the process of the meeting, while the group looks after the content of the meeting. Everyone comes to a meeting with their own agenda and their own preconceptions (and they are often unaware of these). Some want to talk, some want to defend a prior opinion, some want to avoid challenge, some want to challenge, and so on. The facilitator needs to ensure that the group, as a whole, delivers the required result, rather than some individuals delivering their personal agenda. This is particularly true in those KM events which aim to produce value for others, such as Retrospects, where the facilitator needs to play a particularly active role. Even where the meeting is designed to deliver value to the team, for example in a Peer Assist, everyone apart from the facilitator is primarily interested in the content of the meeting. The role of the facilitator is to manage the process of the meeting, and through good process to deliver good content. The facilitator provides "psychological safety"
People need to feel safe in order to be open. 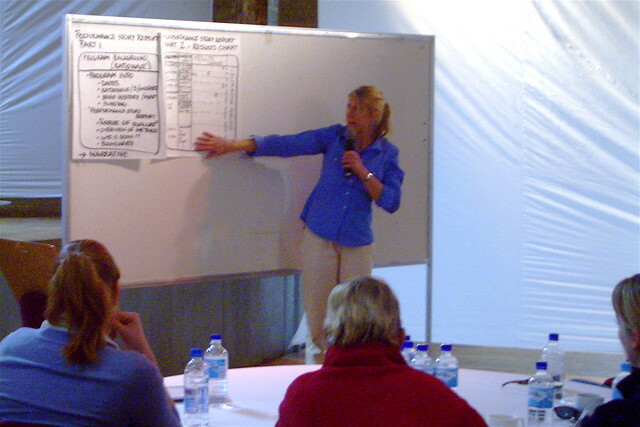 Even if the broader organisation culture is not an open one, the facilitator can still set the tone for the meeting itself through helping the team decide on ground rules for the meeting, and then monitoring behaviours as the meeting progresses - intervening if necessary; for example "I get the feeling we are beginning to criticise and judge each other here. Let's remember our ground rule of "no criticism" and keep listening in an open way?" Sharing knowledge can be a scary thing to do at first, and the facilitator needs to make sure that people feel safe to share. Coaching You do not coach them towards the right answer – you don’t know the right answer – they do! Reviewing and assessing You will not tell them at the end whether they conducted the meeting correctly or incorrectly – you help them to do it correctly! Team leadership The team leader is always interested in the outcome, and cannot facilitate effectively. Your role is a neutral role. You can train the KM team in the skills of KM facilitation. I always suggest this to KM teams, and facilitation is one of the most important skill-sets that you need to develop. The KM team can then provide a facilitation service to the business. You can train a cadre of KM facilitators in the business; perhaps the KM champions, or people within the Project Management office. You can use external facilitators. Several of our Knoco clients have asked us to provide an external facilitation service for major projects, making sure that knowledge capture is always handled in a professional and consistent way, delivering high quality outcome.